i have always had this affinity for granny clothes especially those that come with a gartered waist and electric pleats. i always get overly excited when i see electric pleats and the science behind creating those stunning folds never ceases to amaze me. so when i saw this dress at PHP 50.00 ($1.20), i was immensely elated and couldn’t believe what a steal it was. the dress is pleated, polka dotted and has scalloped sleeves — just my cup of tea. wearing granny clothes can easily lean both ways, looking juvenile like a 13-year old girl or looking well, like a grandma. so i had my dad cut 2 inches off the hem to make the dress more modern. the only regret? he cut it too short because i measured it too short — i was bending when i made the cutting mark! LOL. 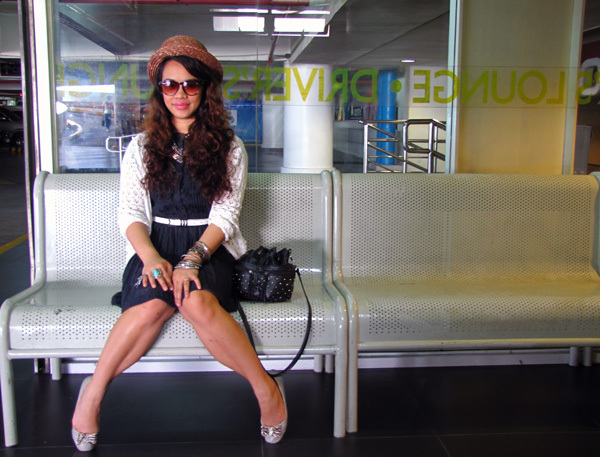 so to style a granny dress more youthfully, i layered on a chunky necklace and studded belt, added gazillions of bangles and a pair of chunky rings to create that extra jingle, topped the outfit with a bowler hat and let my hair down. voila! juvenile and granny no more. what do you guys think? would you wear granny clothes? bongga ang rings! love the dress! You look gorgeous, love the dress and belt. Love your outfit and photos! looks like its from a catalogue or magazine! OMG! i just founf your blog and love itttt..
the rings are absolutely amazing!! That would be one very chic granny if you looked like you 🙂 I'm in LOVE with all the jewelry, especially that amazing winged pinky ring. Your accessories are straight up pimpin' gangsta. The rings are fierce! Adorable outfit! 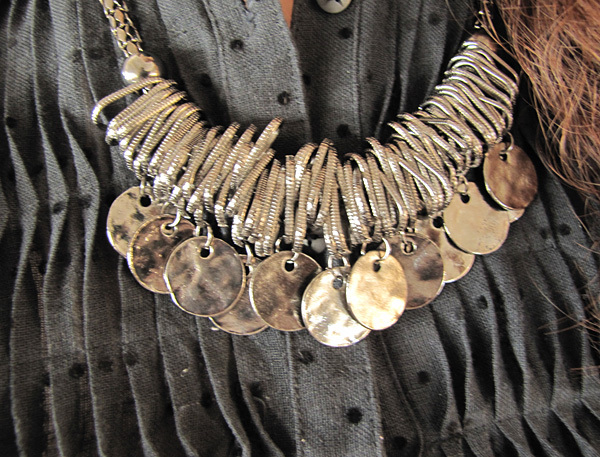 Your necklace is amazing! Yes, I'd totally wear granny clothes! Great dress, and your winged ring is just amazing! You look so beautiful, such a cute combination. let's follow each other? tell me what you think! I am loving the accessories especially the ring my dear…. I miss reading your posts…. Wow, your necklace is so unique! Jealous! But yeah, the vintage-inspired dresses I choose are apparently “granny-style” to my fiancé, so I guess I would wear that! yes, i would wear granny dresses. i have a thing for granny style too but i agree with you… i always wonder whenever i do granny style, whether ill look childish or an old lady. the challenge is always finding a balance… you look great altho i cant see your dress short actually… prolly cos ur sitting down. but still u look great! 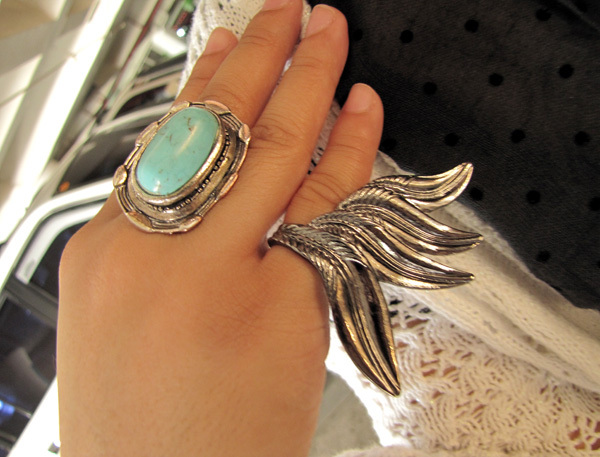 i love that giant angel wing ring !! Awww, you look so cute. Love the hat on you!